Sophomore Eddie Muhl pitches to a Georgetown hitter in a game this past season. Muhl made a seamless transition into his first season as a full-time closer, racking up 17 saves. A treasured tradition at Tucker Field lies a stone’s throw past the bullpen in left field. 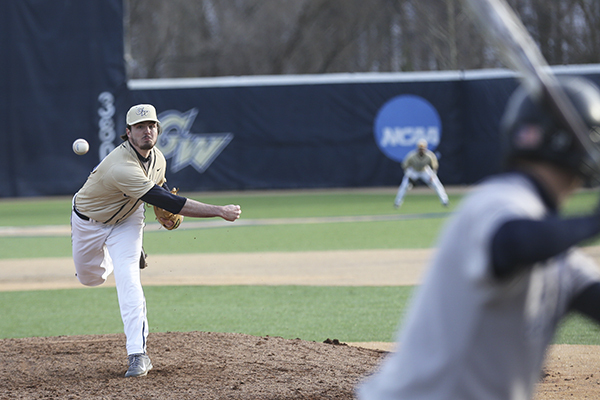 One of the best closers in GW baseball history, sophomore Eddie Muhl, would sneak off from the team’s warmups with fellow standout reliever Craig LeJeune, his graduate student mentor. They would head down to the creek that runs through Barcroft Park to sit together and clear their minds. They were the Bullpen Bash Brothers. But unlike the bash bros in The Mighty Ducks, this duo never suffered from fiery tempers. Over the course of GW’s most successful campaign in a decade, Muhl saved an unprecedented 17 games, cooler in the clutch than the ice in a hockey rink. Muhl led the nation in saves for much of his first year as a full-time closer with an unflappable serenity on the mound that LeJeune helped him refine. Muhl’s 17 saves set single-season records both at GW and in the Atlantic 10, carrying on a family tradition. The 6-foot-4-inch, 210-pound California native’s aunt, Kas Allen, is in the GW Athletic Hall of Fame as an all-time women’s basketball player. At the end of the season, Muhl co-leads the nation in saves. He was tied only with Radford’s Ryan Meisinger, who appeared in seven more games than the Colonials’ closer. Despite the distinction, Muhl was left off the National Collegiate Baseball Writers Association Stopper of the Year finalist list. He was at the top of the list all season long. Muhl would end the season — which he started as a bullpen guy and eventually assumed the role of closer when LeJeune was still not fully recovered from his Tommy John surgery in the spring of his final year of eligibility — with 17 saves and two blown opportunities. He finished with a 2.13 ERA, 20 strikeouts in 25.1 innings, six walks and four extra-base hits allowed. Still, he never really focused on his numbers. Muhl only had two blown save opportunities this season. Last year, Muhl was still finding his footing. He had lost the feel for his old pitching style, throwing from a three-quarter arm slot instead of the sidearm-like style he used back in high school, where he went from starting pitcher to closer in the final months of his career. He started to develop a two-seam-styled change-up. 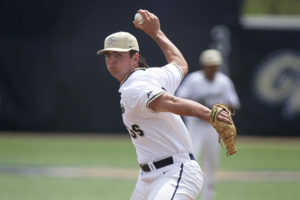 In a low-pressure, non-conference game against Coppin State during Muhl’s freshman year, he threw the final three innings with a six-run lead. To his surprise, LeJeune, the grizzled veteran with the fourth-most saves in program history, came up to him after the game to congratulate his first save. This offseason Muhl will head off to Anchorage, Alaska to play for the Anchorage Glacier Pilots and continue sharpening his game to keep the saves coming next season. “It is about Eddie repeating what he did, being confident in what he did, believe what he did was reality and not some once-in-a-lifetime thing, but you just did that and your goal now is to just be consistent,” Ritchie said. One hurdle will be the departure of LeJeune. Olson could be the new setup man, but he might be too valuable to lose as the go-to middle reliever to save the back end guys. Ritchie said it could be rising sophomore Robbie Metz, the man who picked up the hold in Muhl’s final save. Metz had a strong year as a starter, but Ritchie said he could see moving him to the eighth-inning slot. Regardless of Ritchie’s consistency mantra, the closer in Muhl still strives for perfection.